Just one of the random thoughts that pass through my weird brain, and occasionally escape from my mouth in the presence of high school and college students, who may or may not let me live them down. I will be first in line to buy Mini Arbor Day Eggs. Can you handle the cuteness of this printable topper? I hear that these guys make great S'mores. Add in a Reese's Peanut Butter Cup. This banner makes my heart beat faster. Why am I not hosting Easter this year? Would it be an appropriate year round decoration? Last year I made miss Janey a super fast applique tee using a Peeps coloring page, some buttons and Heat N Bond. It could even be no-sew if you use the ultra hold. So sorry if I offended you Peeps. I think you are adorable. Plus you make some great crafts. Bring on the Cadbury Mini Pumpkin Eggs. That is adorable-I'm totally making one for Storey! Thanks for the fabulous idea! Love peeps. Each year, my Mom and I share one package. More than that is way too much. I remember this! 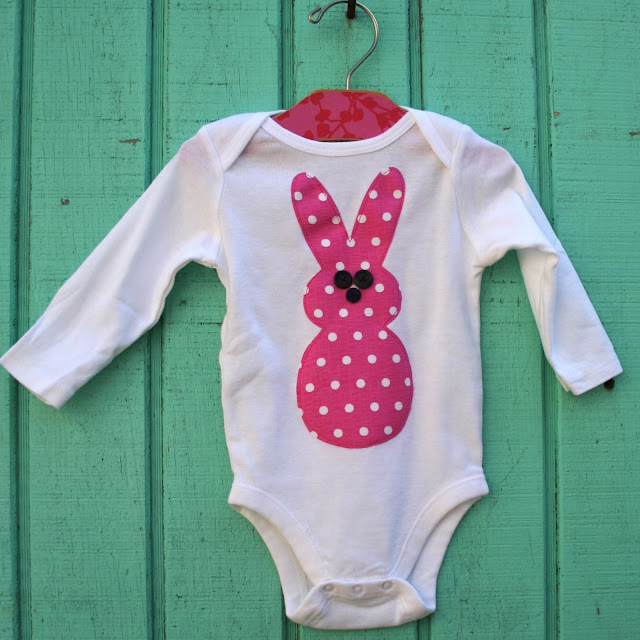 I used this tutorial to make my daughters bunny shirts last year...they turned out to be ADORABLE! I can't believe you posted this TONIGHT! I bookmarked this when you posted it last year hoping that I would be able to sew by this year! And, guess what? I made them about 2 hours ago (all by myself!) I am taking the girls to the Easter Bunny later this week & they will be wearing these! Hey I'm having a PeeP Party, too! Do ya mind if I "borrow" a pic of your BunnY PeeP to feature on my blog? LOvE iT! FYI, did you know this past Christmas Cadbury made mini "egg" Christmas balls they were red green and white, and such a delightful treat! So, so cute! Totally stealing all of your ideas from this post and will eventually blog about it to give credit where credit is due! :) I love them all! and I've never had a S'more in my life, but now I've got to try one with a Peep!!! 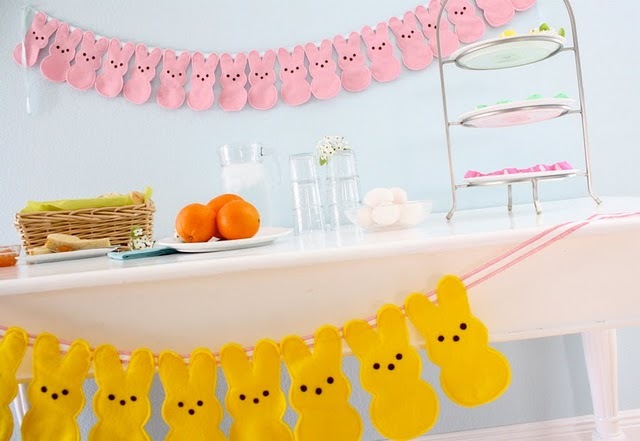 I do like the bunny Peep decor. My friend (Andrea from Knitty Bitties)made the bunting for Bunko last night - it's super cute! 1. 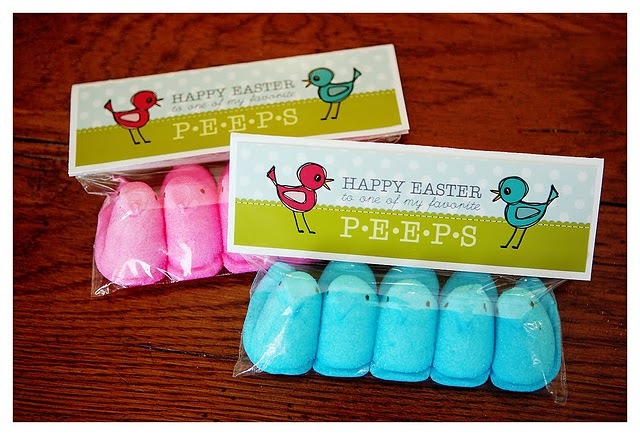 Peeps are grosser than bad fonts. 2. Where are the flag peeps? The ones you have pictured? Are they like the 3D photos that you have to stare really hard at until the image appears because I'm not seeing the flag? Have I had too many babies? Have to admit, I jolted somewhat when I saw the "w" word! GRIN. But I am drawn to Peeps too. I mean...it's only sugar and corn syrup. but something magical happens when they add that addictive food coloring. But...I had never considered such creative ways to use them (besides consuming them) until now! Just as an fyi I saw they are now making chocolate covered peeps :) YUMMY! wha-what? did someone say cadbury mini-eggs? can i get a helz-yeah?! i'm thinking not only for arbor day, but boxing day, tax deadline day, presidents' day, and, basically, any bank holiday. peeps are adorable, but disgusting. MAYBE on a s'more. i categorize them along with those freaky gross orange circus peanut things. oh my gosh, you seriously make me laugh out loud. I needed it, home sick from work. I personally get bugged by anything but the original yellow chick peeps so I am with you on this one. Mmmm~ Peeps smores! Burn, bunny! Burn! I am a complete Cadbury addict! I loved when Walgreens carried Christmas Cadbury Eggs... my hubby completely filled my stocking with them! I love the onesie you made for Miss Janey... I think I'll try to make one for my little sweetie! Thanks! they turned out to be ADORABLE!